Two-term Texas Rep. Lois W. Kolkhorst will be the speaker at the Aug. 9 commencement ceremonies at Sam Houston State University. Kolkhorst (R-Brenham) serves House District 13, which includes Austin, Washington, Grimes and Walker Counties. A native of Brenham, Kolkhorst is the budget and oversight liaison for the Business and Industry Committee and is a member of the House Appropriations Committee, the House Committee on Business and Industry, the Local and Consent Calendars Committee and the House Select Committee on Ethics. She is also the vice-chair of the House Rural Caucus and the vice-chair of the House Caucus on Tourism. This year, Gov. Rick Perry named Kolkhorst to the Clean Coal Technology Council, which advises Perry on the feasibility of new technologies for coal-burning energy in Texas. She is also a member of the Texas Research and Oversight Council on Worker's Compensation, which focuses on statewide worker's compensation issues. Since her election in November 2000, she has been named to the Commerce and Economic Development Task Force of the American Legislative Exchange Council and served as chair of the House Subcommittee on Water Safety. 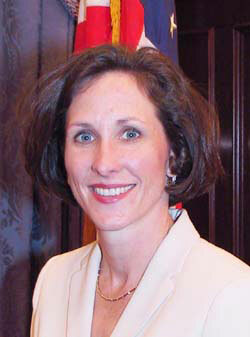 During her freshman session, Kolkhorst authored and passed seven bills, five of which have a statewide impact. In addition, she was been awarded the Freedom and Family Award from Texas Eagle Forum. Kolkhorst is a 1988 graduate of Texas Christian University, where she earned her Bachelor of Science degree in advertising and public relations and was a four-year letter winner for the Lady Frog Golf Team. After graduating, she worked within the TCU athletic administration for eight years. Previously, she has also served as chief executive officer of the Washington County Chamber of Commerce and the Economic Development Foundation of Brenham; has served on the board of the Texas Economic Development Council and the Brazos Valley Workforce Commission; and was appointed by then-Governor George W. Bush to the One-Call Board of Texas. She and her husband Jim, who reside in Brenham, have two children, Lois Kate and Jake. Preliminary figures from the graduation office show that approximately 691 students will receive their degrees, with 530 registered to receive their bachelor's degree, 159 registered to receive their master's degree and two registered to receive their doctoral degree. Degrees will be conferred at the 10 a.m. ceremony for the Colleges of Education and Applied Sciences and Criminal Justice and at 2 p.m. for the Colleges of Arts and Science and Business Administration.